I hate this week of the year, really I loathe it. The ‘Back to School’ aisle in the supermarket was full before school was even out for the Summer, and I don’t want to think about going back until we’ve all had our break. The downside to my refusal to deal with going back to school at the start of the holidays is that by the time I feel ready to think about it the shops are a barren wasteland of all things school and the Halloween and Fireworks have taken over. This poses a number of problems, one of which is my stress levels! 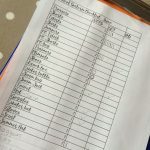 We are very lucky that in our school the kids only need themselves and an easily gettable uniform, with a lunch box if required – no pens, pads, calculators and all that. However, I have a lovely checklist to see what we actually need to get – and some great places to get them. Asking family members with older kids. Trawl of the charity shops for school uniform, they get out all their stocks in late July/early August and if you need a specific branded item you need to stay local, but for generic grey trousers or pinafore dresses ask your friends and family to also keep an eye out. Going ‘halves’ with other families, for example some supermarkets do great deals for PE kit items but in packs of 2… well we only ever need one of everything PE related, so go halves with our neighbour! Go and get the kids feet measured at a reputable shoe shop… I do feel that the kids feet are important and these shoes see a lot of action at school every day so I like to buy good quality ones that should last. I don’t necessarily get them in the shop however – there are outlet stores to check and the world of online choices. We did go the cheap shoe route one year, but the soles came off after just one month! People often gift hardly worn (but outgrown) shoes on free sites, or sell very cheaply on local sites or car boots at this time of year. 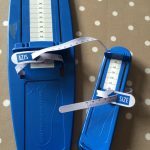 If you have a larger family like ours you could save the horrors of shopping by investing in your own feet measuring tools. You can also download free cut outs to measure feet from StartRite. Check if your school has a second hand shop, and if not offer to start one. This could be online with a Facebook Group very easily and helpful to the whole school community. Be sale savvy – some shops have amazing sales of school uniform, but often at times when it’s not on your radar. You need to become more conscious of when these occur and then can buy the next size up at every opportunity. With the random weather patterns in the UK we have needed all seasons all year round so I buy whatever I can find and add extra layers as necessary! Don’t get lured into buying everything in one hit – kids grow at different rates and you may not need everything at once for September. Check what they actually need for that first few weeks. Depending on the weather you could leave getting a tracksuit until the October half term maybe? This helps spread some of the costs out. 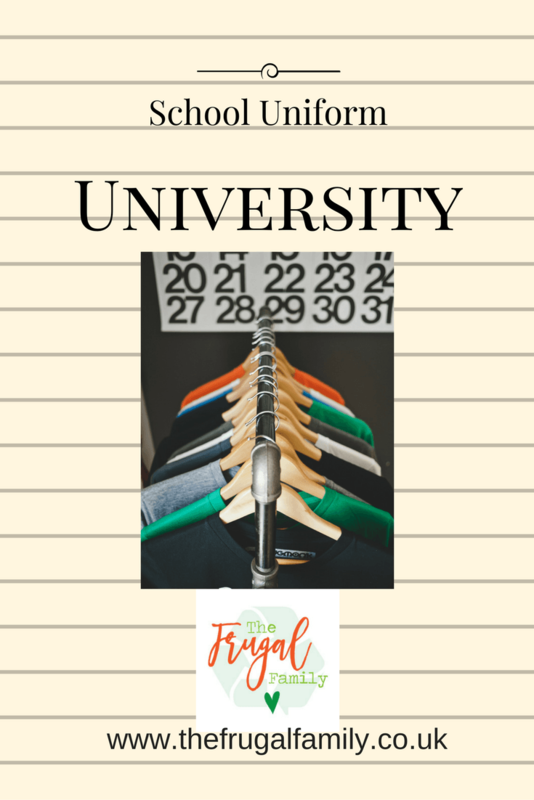 Try to establish a laundry schedule that reduces uniform needs, so you don’t need 5 of everything… who am I kidding?? Remember you can add cycle shorts/tights under a dress that is bit shorter than you would like. Get sewing and turn trousers that are too short into shorts. You may also be able to shorten long sleeve shirts that have had the cuffs and elbows ruined. 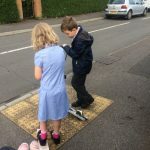 I am about the enter my week of Back to School here at Frugal HQ and so I may well discover new and interesting things as I weave my way through again, which I promise to add on here. While I love school and learning and all of the wonderful adventures of life school starts, I’m not a great fan of having to be out of the house at a set time and in set clothes and I REALLY don’t like homework! So, part of my own way of managing the new routine is about helping myself and the kids to deal with the schedule of school – but more about that next week. These are such great tips! Being organized with a list and taking inventory before shopping is key. Also, I’ve never seen one of those shoe size things. So cool! Ah thanks. We managed to only need new trainers, plimsolls, one pair of shoes, trousers and 2 t-shirts. Pretty happy with that, too-short trousers are being turned into shorts, but the weather looks like that is an unnecessary job!